Osteocytes reside as a cellular network throughout the mineralised matrix of bone and are considered the primary mechanosensors of this tissue. They sense mechanical stimulation such as fluid flow and are able to regulate osteoblast and osteoclast functions on the bone surface. Previously, we found that ATP is released load-dependently from osteocytes from the onset of mechanical stimulation. 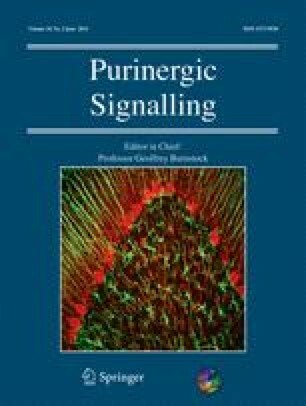 Therefore, the aim of the present study was to investigate whether and how ATP release can be evoked in osteocytes via purinergic receptor activation. ATP release was quantified by real-time determination using the luciferin-luciferase assay and the release pathway was investigated using pharmacological inhibition. The P2Y receptor profile was analysed using gene expression analysis by reverse transcription polymerase chain reaction, while functional testing was performed using measurements of intracellular calcium responses to P2 receptor agonists. These investigations demonstrated that MLO-Y4 osteocytes express functional P2Y2, P2Y4, P2Y12 and P2Y13 receptors in addition to the previously reported P2X receptors. Further, we found that osteocytes respond to nucleotides such as ATP, UTP and ADP by increasing the intracellular calcium concentration and that they release ATP dose-dependently upon stimulation with 1–10 μM UTP. In addition to this, osteocytes release large amounts of ATP upon cell rupture, which might also be a source for other nucleotides, such as UTP. These findings indicate that mechanically induced ATP signals may be propagated by P2 receptor activation and further ATP release in the osteocyte network and implicate purinergic signalling as a central signalling pathway in osteocyte mechanotransduction. We thank Dr. Lynda F. Bonewald (University of Missouri, Kansas City School of Dentistry, Kansas City, MO, USA) for kindly providing us with the MLO-Y4 osteocytes and Ole Vang (Roskilde University, Roskilde, Denmark) for academic discussion of study design and results. The work was kindly supported by the European Commission under the 7th Framework Programme (proposal #202231) performed as a collaborative project among the members of the ATPBone Consortium (Copenhagen University, University College London, University of Maastricht, University of Ferrara, University of Liverpool, University of Sheffield, and Université Libre de Bruxelles) and is a substudy under the main study “Fighting osteoporosis by blocking nucleotides: purinergic signalling in bone formation and homeostasis”. The work was also supported by The Faculty of Health Sciences, Copenhagen University (grant# 211-0457/08-3012), The Danish Council for Independent Research, Medical Sciences (grant# 271080789) and Natural Sciences (10-085217) and The Toyota Foundation (grant# OH/BG-6360).